More Info: ​1 parking permit included per bedroom. In the historic Hyde Park neighborhood of the University of Texas at Austin campus, you’ll find the one and two-bedroom apartments of Hyde Park Court. These Hyde Park apartments offer endless alternative living options for students looking to explore beyond the offerings of UT Austin dormitories. This area tends to veer towards the quieter side of things in comparison to the hustle and bustle of West Campus and West Downtown. It’s full of architectural appeal from surrounding historical homes, and the tree-lined streets are biker-friendly. If you’re commuting by foot, Guadalupe (aka “The Drag”) is a block away down 38th street. You can also take advantage of the UT Austin’s shuttle system, with pick-up locations near these Hyde Park apartments. Walking and bike friendly streets are accessible to get to your class on time, relax at the park, or just hang out in the nearby coffee houses, bakeries, theater, and shops. Medical centers and offices are within a mile radius from the complex. On Guadalupe Street is where you’ll find plenty to choose from in terms of dining, entertainment, shopping, and more. The Hyde Park Theater is a 12-minute walk from your front door, and home to regular performances from local and emerging playwrights. You’ll also be within walking distance of hot spots like Quack’s 43rd Street Bakery, Mother’s Cafe (a favorite for vegetarian and vegan-friendly cuisine), and Snooze. These Hyde Park apartments in Austin are well-laid out with spacious floor plans and open kitchen concepts with pass-through bars. 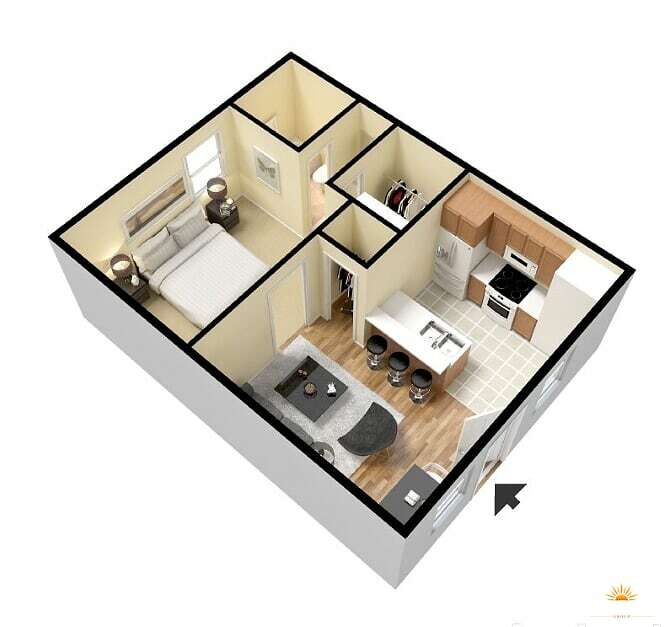 Units also include large closets, ceiling fans, faux wood floors, and a parking permit for every bedroom. Some extra outdoor storage spaces are also available. Gas and trash are included in the cost of monthly rent, starting at $950/month for one-bedroom units. The unit may be shared with a roommate. The Westside Group’s Hyde Park apartments are pet-friendly to 25 lbs. and under, with plenty of nearby parks and dog-friendly shops around the neighborhood. Whether you’re relaxing at home or headed out for a night on the town, there’s something for everyone at Hyde Park Court. Other: Gas and Trash included.